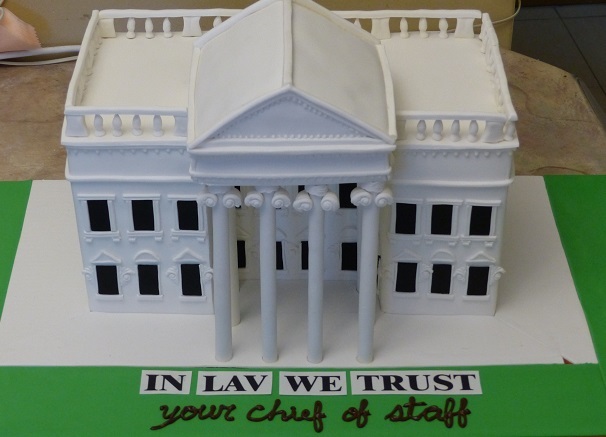 Who orders a White House cake for Mishloach Manot you ask? Answer: The staff at an orthodontists office. Their boss was dressing up as Donald Trump and they thought it would be the perfect gift for his Purim Seuda. And oh it was! Only problem is, no one wanted to cut into it! When this order came in I knew It was not going to be a quicky. Being good at baking cakes is just not enough when working with fondant design, ESPECIALLY with a cake like this. The customer wanted a 3-D replica of the white house with as many details as possible. A degree in architecture would have come in handy! I must say, it took quite a bit of planning. My favorite part was the pillars and the windows, as soon as they were up I relaxed a little. It was starting to look like the White house! In the end the cake was served in the reception area of the office and every patient that came in got a taste. An orthodontist office giving out cake to its patients. OUTSTANDING! Gorgeous Sara…very well done!